DDA helps promote a feature length motion picture with an interactive and animated DVD. 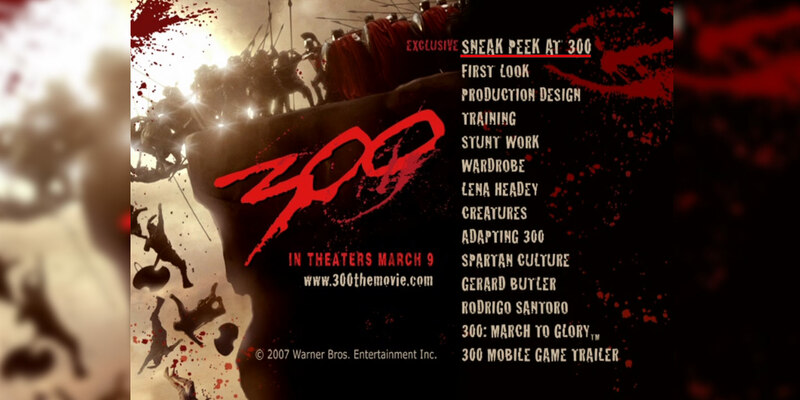 Warner Brothers was about to release the highly anticipated film, 300, starring Gerard Butler, and so they needed to start a buzz in the industry and with audiences. There was a multitude of special features available, such as movie clips, actor interviews, and behind-the-scenes video that needed to be complied and organized into one comprehensive promotional package to fuel interest and excitement for the film. As a state-of-the-art video production company, DDA Video was brought on board to assemble the footage and create a menu for this promotional DVD. The menu needed to be easy to navigate while still eliciting the excitement needed to drive movie goers to see this film. Packed with video clips, interviews, and behind-the-scenes extras, DDA compiled all the materials and authored the final promotional DVD, making it ready to excite and interest potential viewers. The interactive and animated menu allowed viewers to scroll with ease through each chapter and select the section they wanted to view. By making menu navigation interactive and sharing inside information from the movie, this promotional DVD is transformed into a more personalized experience, connecting viewers with the film, thus making them more invested. The total running time of the DVD is approximately 45 minutes, giving viewers plenty of time to get excited about the movie and enticing them to see more.